Well, they've gone and done that. All-Clad's brilliant range of stainless steel cookware is now among America's favourites, beloved by professional chefs and serious cooks all over the world. With that achievement under their belt, All-Clad have decided to create cooking utensils to match their pots and pans and woks and tagines, for an all-round All-Clad experience in the kitchen. 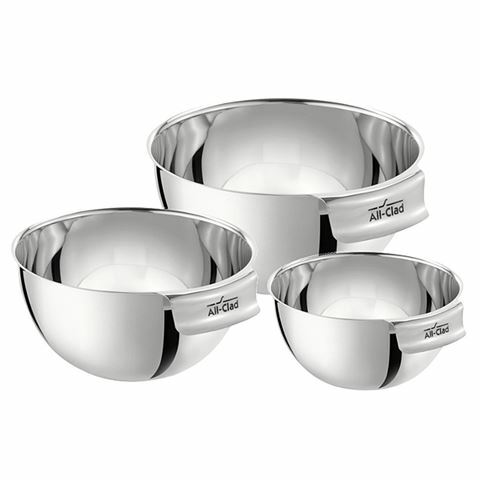 This fantastic mixing bowl set won’t look out of place among your other All Clad pieces, or adds a shiny accent to your pre-existing kitchen tools. Made from high quality, heavy gauge stainless steel, each bowl possesses an integrated handle for easy and secure use, while each bowl’s surface is easy to clean and will not react with food. Integrated handle allows for easy and secure use. Easy to clean; will not react with food.